RoofBag Cross Country Car Top Carrier | 100% Waterproof Soft Cargo Carrier | For Cars With Rack. 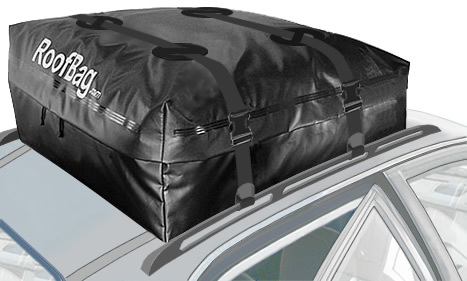 RoofBag Cross Country car top carriers offer the best weather protection and durability. Cross Country carriers are extra rugged and waterproof, made to withstand the most severe weather conditions and rough handling and still protect your belongings for many years. No effort has been spared in making this rooftop carrier the most waterproof and durable carrier in its class. RoofBag Cross Country carrier comes with 2 Pass-Through Straps for use on cars WITHOUT roof rack if you select a car top carrier for a car with no rack, or alternatively with 2 Rack Straps for attachment to a roof rack, if you select a car top carrier for a car with rack. Straps are heavy-duty, seat-belt type, 1.5 inches wide, and include two heavy-duty side-release buckles per strap, to provide easy access to the roof top carrier's contents. Straps are also water-repellent, so they won't wick water and won't get soaked. Pass-Through straps are installed through the inside of the car with open doors. Doors close over the straps without interference. The length of each Inside Strap can be adjusted at either of the two side-release buckles. The maximum length of each Inside Strap is 12 feet. Rack Straps attach to side rails or cross bars by a slip knot created by passing the buckle through a loop at the other end of the strap. • All-welded - All corner joints are electrically welded (not sewn) for maximum water-proofness and strength. No exposed stitching means no chance for water to wick through needle holes. • Electrically sealed zipper flap - (not sewn) The zipper flap covers the zipper for added water protection. In the Cross Country roof top carrier you can tell the zipper flap is welded by the shiny triple band along the zipper flap. • Fully waterproof fabric - Heavy-duty, 18-oz, double vinyl-coated polyester is also resistant to extreme cold, heat, abrasion or ripping. • Rain cannot enter through zipper tape - Zipper tape is waterproof. (However, the zipper teeth are not fully waterproof. Zipper flap must be vertical to fully protect zipper from rain). • Easy access to contents: zipper covers 3 sides of carrier and has 2 pullers. • Keeps contents dry even in the worst of storms. • Best straps in the market - Straps are water-repellent (will not absorb or wick water), 1.5 inch-wide seat-belt style, are tested to 1,000 pounds, and have 2 heavy-duty buckles per strap for easy access to contents. • Quiet ride and fuel efficient - Thanks to RoofBag's aerodynamic shape.